In the name of Allaah, the Most Merciful, the One who bestows Mercy. Tawheed is the fundamental of Islaam upon which Islaam is built. It is the condition of its acceptance – by way of it the good deeds are accepted, and the sins are forgiven. Due to it the servant enters Paradise, and he is saved from the Hellfire. Due to it, the Messengers and the polytheists fell into disputation. Due to it the swords of Jihaad clashed and due to it Paradise and Hell were created. Due to Shirk, the servant is forbidden from Paradise, and eternal residence in the Hellfire is made obligatory upon him. For this reason, the concern for Tawheed is the most important of affairs, the most obligatory of obligations. Its abandonment, turning away from it, and from learning it, is the greatest of afflictions. So for this reason it is binding upon each and every person to study it, and to study that which nullifies it, negates it, diminishes it or that which maligns and disfigures it. 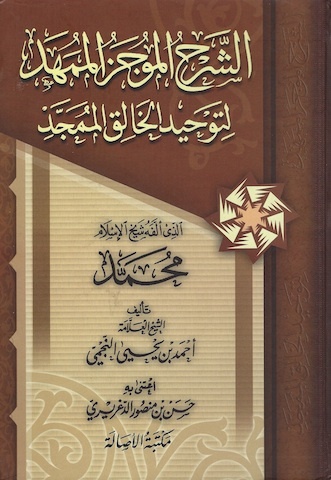 From the best of that which has been authored in the subject is “Kitaab at-Tawheed” of Shaikhul-Islaam Muhammad ibn Abdul-Wahhaab (rahimahullaah), by way of whom Allaah revived the Creed of Tawheed in the region of Najd [in Arabia] in twelfth century after the Hijrah. He composed the book into sixty six chapters. It was further explained by some of his sons, grandsons, his students and other than them. So some of the students of knowledge were eager for me to explain this book to them. They were not satisfied with merely reading the older explanations; rather they insisted that I dictate an explanation of the book from myself. I sought the aid of Allaah, the Most High, and I began to dictate than which came to mind, so they penned that down. It was presented to some sheikhs who were eager to do good, and eager to spread knowledge – they desired for it it to be transcribed onto a computer. And after the first student was absent for a long time, then a another picked up from where the previous one left off and proceeded with me in the same manner, and all praise is due to Allaah for its completion. The point being, the result of that is a beneficial and summarised explanation of the subject matter, fulfilling its goal, inshaa’Allaah. I entitled it: “Ash-Sharh al-Moojaz al-Mumahhad li Tawheed al-Khaaliq al-Mumajjad alladhi allafahu Shaikhul-Islaam Muhammad” (The Concise Simple and Straight-forward Explanation of the Tawheed of the Exalted Creator – which was Authored by the Shaikhul-Islaam Muhammad b. Abdul-Wahhaab). All praise is due to Allaah for that – and we ask Allaah that He gives us sincerity in that which we bring of goodness, and that which we leave behind. May the prayers, salutations and peace of Allaah be upon our Prophet Muhammad, upon his family and all of his Companions. [Ash-Shaikh, al-‘Allaamah, al-Muftee] Ahmad b. Yahyaa b. Shabeer an-Najmee, dated, 21/7/1425 AH.